The activity of neurons in the brain is noisy in that their firing times are random when they are firing at a given mean rate. 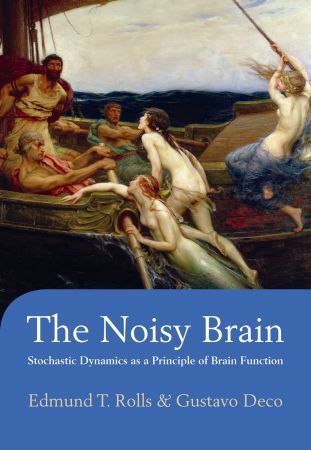 This introduces a random or stochastic property into brain processing which we show in this book is fundamental to understanding many aspects of brain function, including probabilistic decision making, perception, memory recall, short-term memory, attention, and even creativity. In The Noisy Brain we show that in many of these processes, the noise caused by the random neuronal firing times is useful. The Noisy Brain provides a unifying computational approach to brain function that links the synaptic and biophysical properties of neurons, the firing of single neurons, large connected networks of noisy neurons, functional neuroimaging, and behaviour. The book describes integrate-and-fire neuronal attractor networks with noise, and complementary mean-field analyses using approaches from theoretical physics. The book shows how they can be used to understand decision-making, perception, memory recall, short-term memory, attention, and brain dysfunctions that occur in schizophrenia, normal aging, and obsessive-compulsive disorder. The Noisy Brain will be valuable for those in the fields of neuroscience, psychology, cognitive neuroscience, and biology from advanced undergraduate level upwards. It will also be of interest to those interested in neuroeconomics, animal behaviour, zoology, psychiatry, neurology, medicine, physics, and philosophy. The book has been written with modular chapters and sections, making it possible to select particular Chapters for course work. Advanced material on the physics of stochastic dynamics in the brain is contained in the Appendix.